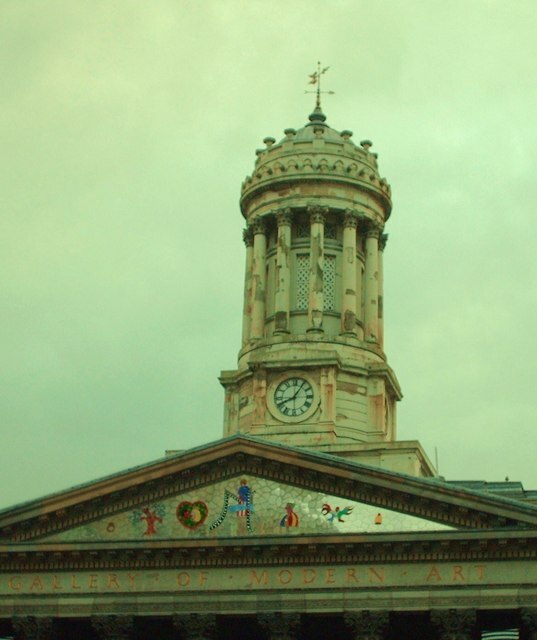 Gary's photo NS5965 : Glasgow Gallery of Modern Art shows nicely the original part of the building behind the portico - Tobacco Lord Wm Cunningham's mansion, 1778 - picture the building surrounded by gardens. Bought 1817 by Royal Bank, sold on to become Royal Exchange 1827, when bank built new premises behind. It was then extended and had the portico added. The hall at the back is splendid. The town's first telephone exchange was in the mansard, added 1880. It was taken over by the council in 1949 to house Stirling's Library. In 1996, refurbished to become GOMA. A f ew years ago the bsaement was remodelled again to house a library and cafe.